Osborne Reynolds had developed an interest in problems connected with the dynamics of ships, particularly screw steamers, a number of years prior to coming to Manchester, probably dating back to his apprenticeship with Edward Hayes at Stony Stratford. This further parallel stream of research led to publications in the Transactions of the Institution of Naval Architects and later to a long involvement in work concerned with the safety of ships. Much of the work was carried out under the auspices of a specially formed committee of the British Association for the Advancement of Science which included, amongst others, Kelvin, Froude and Rayleigh, and for which Reynolds produced a series of important lengthy reports. His attention later turned to waves and currents and the laws relating the scaling of experiments to study flow in rivers, estuaries and foreshores. A further series of reports for the British Association followed. The first fruits of the interest in ships inculcated at Stony Stratford were his publications in 1873 and 1874 on the racing of screw propellers (Papers 9 and 14). By showing this to be the result of the admission of air Reynolds was among the first to recognize the important influence which air can exert on a mass of water in which it is dissolved or occluded. From his studies, he deduced that it is more important to ensure that a propeller is sufficiently submerged than to increase its diameter and that it seemed likely that some of the advantage of twin screws was derived from their depth of immersion being generally greater than that for a single screw. `the reversing of the screw of a vessel with full way on very much diminishes her steering-power,... so that where a collision is imminent, to reverse the screw and use the rudder as if the ship would answer to it in the usual manner is a certain way of bringing about the collision'. His model experiments indicated, moreover, that the influence of reversing the screw to turn the vessel independently of her rudder was most pronounced when the screw was not deeply submerged. Reynolds went so far as to suggest, Paper 26 (1876), that models in the form of steam- launches should be used for training naval officers in the manoeuvring of ships. This proposal was not adopted, but Reynolds' views had aroused so much interest and concern that the British Association appointed a committee, with Reynolds as Secretary, to collect and examine evidence concerning the steering qualities of steamships. In addition to having tests made on actual ships, the Committee received reports from ships' masters who had carried out similar experiments on their own merchant vessels. Reynolds produced three detailed reports for the Committee on this work ( Papers 28, 32 and 37). In their 1878 Report, the British Association Committee affirmed that `the conclusions drawn by Professor Reynolds from experiments on models have been fully confirmed by the experiments on full-sized ships'. Reynolds returned to the subject of ship-models some years later after a disaster had occurred with the St. Annes and Southport lifeboats. Within a week of this tragic occurrence, he read his paper `On Methods of Investigating the Qualities of Lifeboats' to the Manchester Literary and Philosophical Society, Paper 54 (1886), in which he urged that scale-models should be used to test the sea-going qualities of lifeboats. From the dynamics of ships we turn next to the development of hydraulic machinery and in particular pumps and turbines. In matters of innovation and invention Reynolds was never motivated by financial gain and it is doubtful whether he ever had any monetary reward from any of his inventions. He did, however, take out a number of patents. These are listed in the appendix to this paper. The patent for `improvements in turbines and centrifugal pumps', the specification for which is dated 1875, is reprinted as Paper 20 in Volume I of the Collected Works. It reads, in many respects, like a research-paper and at the same time demonstrates Reynolds' great powers as an engineer and inventor. `on emerging from the moving passages the fluid shall not, as in the case of the ordinary turbine, have spent the whole or nearly the whole of its available pressure, but that it shall still have sufficient pressure to carry it through one or more additional sets of passages... that is to say, on emerging from the first moving passages, it shall again be received into other fixed passages, so that on being forced through them it shall emerge with a velocity of whirl or rotary motion round an axis - not necessarily the same as before - with a reduced pressure, and again be received into another set of moving passages from which it may emerge with no velocity of whirl... On emerging from the last set of passages the fluid will be allowed to flow away into such receptacle, channel or tail-race as may be provided'. 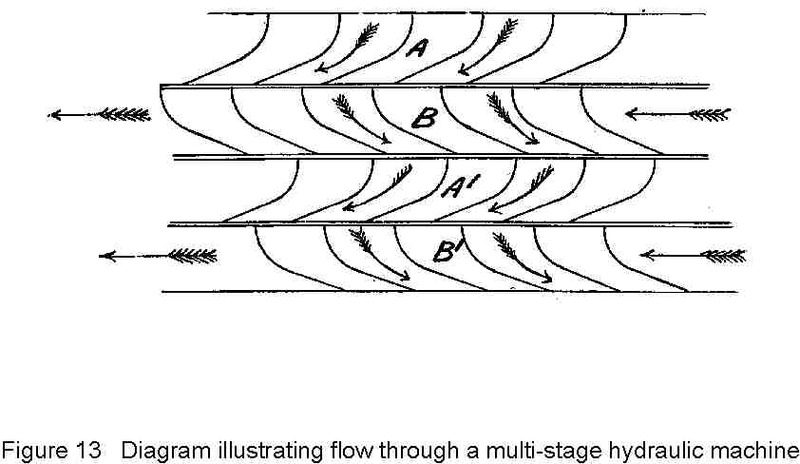 Reynolds describes how these sets of passages may be arranged side by side as in a parallel (axial) flow turbine or one set within the other in radial fashion. Figure 13 is taken from his specification which goes on to state that the inverse arrangement could serve as a multi-stage centrifugal pump and that the invention `applies to all fluids, liquids, vapours and gases.' He further incorporated the idea of guide-vanes and divergent passages surrounding the impeller of a centrifugal pump for the improved recovery of dynamic head and the concept of movable guide-vanes for regulating the inflow to water turbines. The first multi-stage, or `turbine pump' as it is rather ambiguously described, was successfully installed in Reynolds' own laboratories. Prototypes of his pumps and turbines are on display in the exhibition referred to earlier. A.H. Gibson  has pointed out that in his 1875 patent specification, Reynolds anticipated both the multi-stage turbine of the Parsons type and the turbine with opposite rotation of the two elements as in the Ljungstrom turbine. About this time (1875-76), Reynolds did in fact experiment with a two-stage small radial-flow steam turbine with a wheel- diameter of 6 inches which ran at 12,000 revolutions per minute. While it worked successfully, its consumption of steam was high, probably because of relatively large losses between the blades and the casing. 1887 marked another of Reynolds pre-eminent contributions. In that year he addressed the Manchester meeting of the British Association `On Certain Laws Relating to the R‚gime of Rivers and Estuaries, and on the Possibility of Experiments on a Small Scale' (Paper 55). Reynolds had, therefore, established the rule that if the horizontal scale is 1/x and the vertical scale is 1/y, the logical corollary is that the velocity-scale should be 1/ûy and the time- scale for tidal periods ûy/x. This was a major advance and opened up great possibilities for modelling flow in rivers and estuaries. 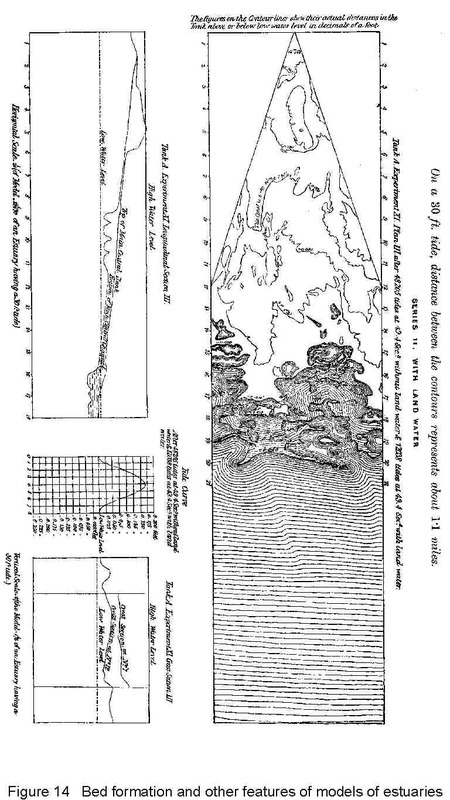 In addition Reynolds astutely observed that his tide-generator also accurately shaped the sand he had placed in the model (to ensure the correct mean depth of water at high tide) to mirror the principal features of the natural estuary. So strong was the evidence presented by Reynolds that the British Association immediately acted to establish a committee to investigate the action of waves and currents on the beds and foreshores of estuaries by means of working models. The research was planned and carried out by Reynolds in the Whitworth Engineering Laboratory at Owens College, and three Reports were issued, Papers 57, 58 and 59 (1889, 1890, 1891). These were written by Reynolds himself and described in great detail the experiments made on model estuaries of hypothetical shape: rectangular, V-shaped, and V-shaped with straight tidal rivers added at the upper ends. Figure 14 gives some idea of the bed formation and other features of one of these models. To conclude this review of Reynolds' work on hydraulics we come to a short paper presented at a meeting of the British Association at Oxford entitled `Experiments concerned with the boiling of water in an open tube at ordinary temperatures', Paper 63 (1894). The paper begins with a description of the processes involved in the boiling of water by heating it. However, it is really about the phenomenon of cavitation, a common problem in hydraulic machinery involving the production of vapour bubbles in flowing water as a result of the pressure being reduced locally to the point where nucleation occurs. Nowhere in the paper does Reynolds use the word `cavitation', yet both here and in his investigation of the racing of screw propellers, he was patently demonstrating his understanding of it. This area of work interested Osborne Reynolds throughout his career. There can be no doubt that the presence in Manchester of the eminent scientist Joule was an important influence at the outset. To this can be added the influence of Rankine, whose texts Reynolds frequently referred to. Reynolds' early contributions on the effect of air on the rate of condensation of steam at a surface and on the extent and action of heating surfaces for steam boilers were followed after a gap of about ten years by detailed studies on the steam engine indicator and trials on a large triple expansion steam engine, culminating in 1897 in a classical experiment using that equipment to determine the mechanical equivalent of heat. The later studies highlight Reynolds' outstanding practical ability and his interest in experimentation using full scale engineering plant. His papers are to be found in both Volumes I and II of the Collected Works. Some were published by the Institution of Civil Engineers and others by the Royal Society. `that in consequence of this effect of air it is necessary for the size of a surface- condenser for a steam-engine to increase very rapidly with the quantity of air allowed to be present within it; ... and that by mixing air with the steam before it is used, the condensation at the surface of a cylinder may be greatly diminished, and consequently the efficiency of the engine increased'. In 1874 (some nine years before the appearance of the famous paper on laminar and turbulent flow) Reynolds produced a short and farsighted paper, `On the extent and action of the heating surface of steam boilers', in which he pointed out that heat is removed from such a surface not only through molecular action but also by the turbulent eddies present in the flow which mix hotter fluid with cooler fluid. He argued and demonstrated experimentally that if hot gas flowed at sufficiently high speed through a tube, the temperature of which was maintained constant, the temperature of the gas emerging from the end of the tube would be sensibly independent of any further increase of speed. This effect he related to the fact that under such conditions the resistance to flow is sensibly proportional to the square of the velocity, thereby inferring an analogy between heat-transfer and skin-friction. Almost half a century was to pass before these ideas were taken up and the analogy extended by later authorities such as Taylor, Prandtl and von Karman. To assist his audience in understanding the ideas involved he went on later to use a simple mechanical contrivance to demonstrate the problem of converting heat into work. It is indicative of his approach that not a single equation or even a mathematical symbol appears anywhere in his paper. In a paper read before the Manchester Literary and Philosophical Society in November 1885 (Paper 53), Reynolds considered the thermodynamics of fluid flow in the case of a gas or vapour discharging from one vessel into another through an orifice or nozzle. He called attention to the fallacy of the assumption that the pressure in the receiving vessel is the same as that at the orifice, and went on to consider the observation that the rate of flow was only affected by the pressure in the receiver if that were greater than about half of the pressure in the upstream vessel. Moreover, he established that the reason for this lay in the fact that a limit to the flow is reached when the velocity at the orifice becomes equal to the velocity of sound at that point. 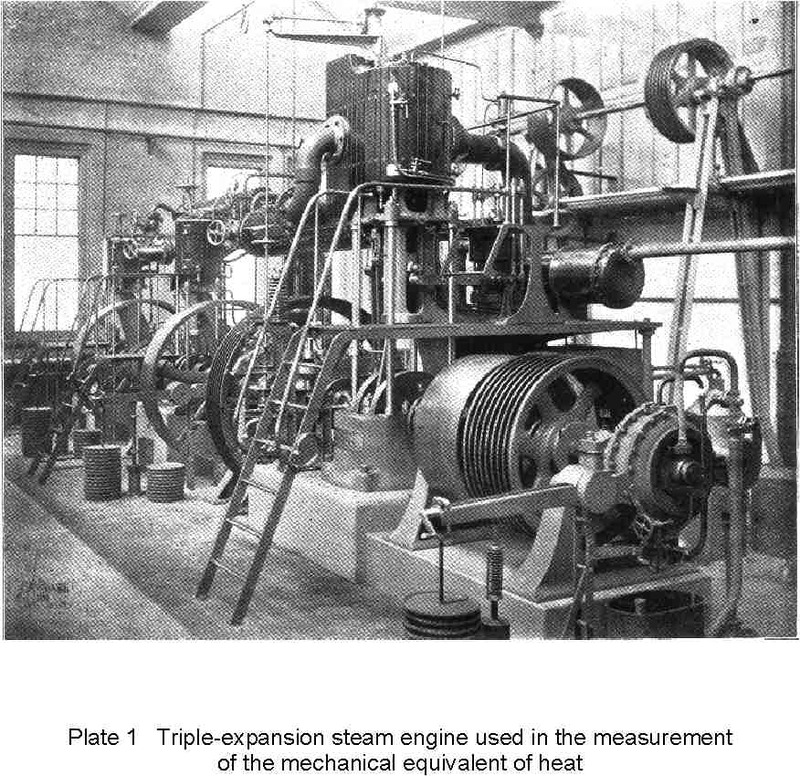 In Paper 56 read to the Institution of Civil Engineers in December 1889, Reynolds described with some pride the large triple-expansion steam engine which had been installed under his close supervision in the Whitworth Engineering Laboratory at Owens College (see Figure 16). Characteristically, Reynolds ensured that this new test facility was extremely flexible. The engine could be operated as a triple-expansion condensing engine or run in a variety of other ways. In his address he defined the purpose of the engines as two-fold; (i) to afford students practice in making the many measurements involved in steam engine-trials, to give them an insight into the action of the steam and the mechanical components and to familiarize them with good design; (ii) to supply a means of research by which the knowledge of the steam- engine could be extended. The detailed design and the construction of the engines and the boiler were undertaken by Messrs. Mather and Platt, whose `zeal and liberality' Reynolds gratefully acknowledged. It was decided to have the three engines on separate brakes and that these should be hydraulic devices rather than ones dependent on mechanical friction. William Froude had earlier developed a radically new design for a compact hydraulic brake for determining the power of large engines. Accordingly, Reynolds tested a 4-inch diameter model of the new design. He found that when the speed exceeded a certain limit, the brake partially emptied itself of water and the resistance correspondingly decreased. To overcome this defect, Reynolds had radial holes drilled through the metal of the fixed vanes in such a way as to maintain the water in the brake at atmospheric pressure or above it under all conditions of operation. 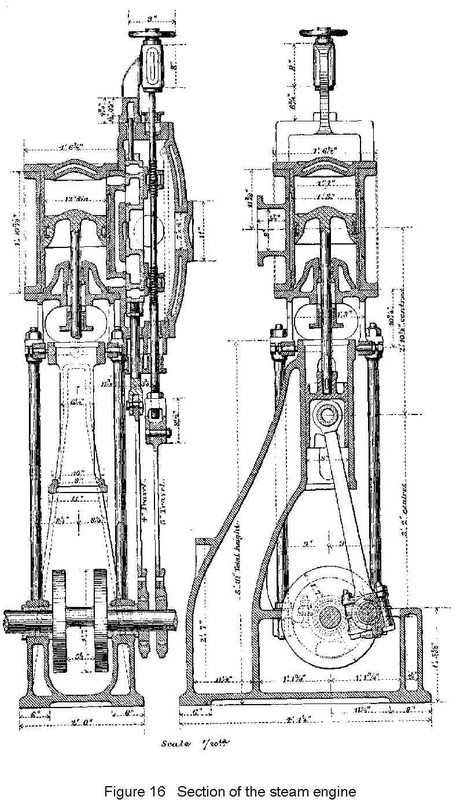 Having tested this idea out using his model, Reynolds adopted it successfully on the 18-inch wheels which became the hydraulic brakes for his three-cylinder steam engine. 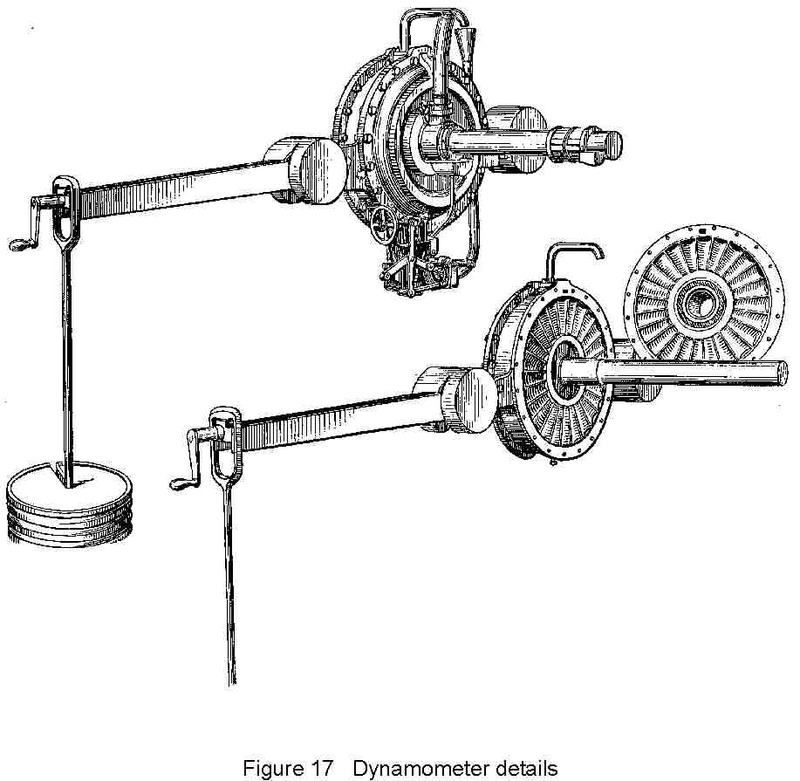 The dynamometer is illustrated in Figure 17. As a result of these efforts Reynolds had brought into being a large-scale apparatus suitable for the most accurate determination yet of Joule's mechanical equivalent of heat. 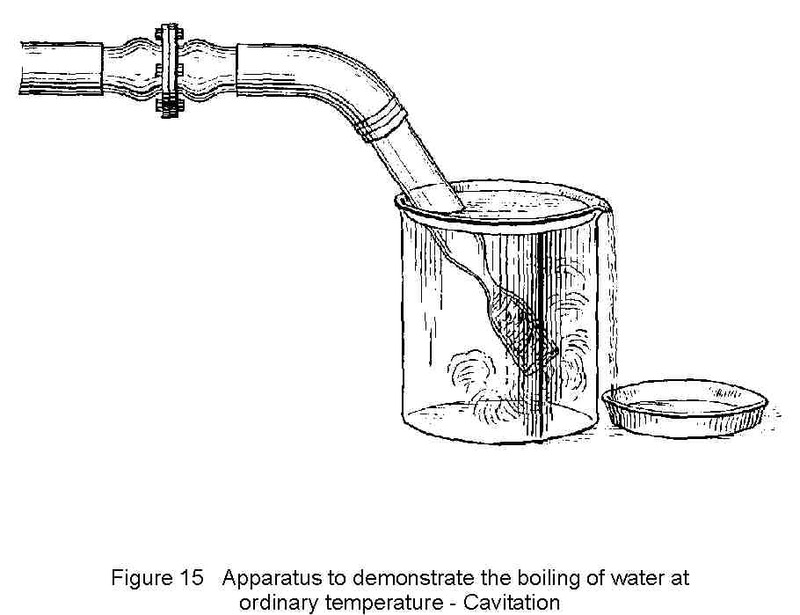 Reynolds recognised that the attraction lay not only in the magnitude of the quantities to be measured but also in the possibility of using two physically fixed points of temperature by measuring the quantity of work required to heat a known mass of water from freezing point to boiling point. This could be achieved by feeding water continuously at freezing temperature to the brake in which the internal fluid friction would heat it to boiling point. This classic investigation was described in great detail in Paper 66, the Bakerian Lecture to the Royal Society in May 1897. The apparatus is shown in Plate 1. 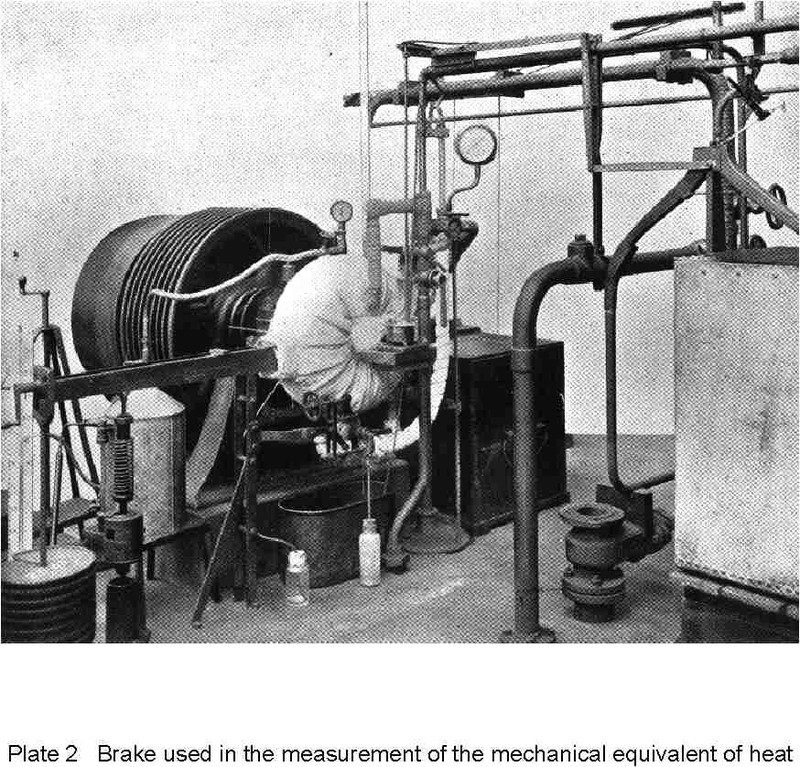 Plate 2 shows the brake and some associated equipment. One of the striking features of the study is the thorough consideration given to the circumstances which might affect the accuracy of the results. Twenty-five possible sources of error are tabulated, together with an assessment of the limits of relative errors to which they could give rise. Five years earlier, in 1892, Reynolds had produced a brilliant biography for the Manchester Literary and Philosophical Society simply entitled `Memoir of James Prescott Joule' , but his re-determination of the mechanical equivalent of heat perhaps represented the ultimate tribute Reynolds was able to pay to him. This lesser known side of Reynolds' work encompassed a wide variety o f topics mainly of a rather practical nature. These include: elasticity and fracture; properties of steel; stress concentration; inertial forces and stresses; friction; slipping of belts and straps; rolling friction; vibration measurement; and last but not least, the fatigue of materials subjected to repeated loading. We do not have to look far to detect the incentive for such work. In the city of Manchester Reynolds was surrounded by intensive mechanical engineering activity with all its attendant problems. A number of his papers on these themes were published in The Engineer. His pioneering work on rolling friction was presented to the Royal Society as was his collaborative work on repeated stresses and fatigue. In Paper 17 `On the efficiency of belts or straps as communicators of work' (1874), Reynolds explained the slipping of the strap used for a belt-drive between two pulleys. The elasticity of the belt caused the tight side to be stretched more than the slacker side and correspondingly the tight side had to move faster. Some months later, in the Philosophical Transactions of the Royal Society, Paper 18 (1875), he extended this concept to a detailed study of rolling friction, arguing and demonstrating experimentally that, as in the case of endless belts over pulleys, there would be an `analogous slipping when a hard roller rolls on a soft surface, or when an india-rubber wheel rolls on a hard surface'. He found that `an iron roller rolled through something like three-quarters of an inch less in a yard when rolling on india-rubber than when rolling on wood or iron'. He proceeded to show that, whatever the nature of the materials, the deformation at the point of contact must cause slipping to occur, even though this would be difficult to measure with hard materials. In this way, he accounted for the resistance to the motion of a roller, and further explained the disquieting phenomenon of the scaling of wrought-iron railway rails as being a consequence of the slipping which attends the rolling. Reynolds' four articles in The Engineer (1881-82) on the `Fundamental Limits to Speed' (Paper 41) remind us that what is common knowledge today was not at all clearly understood before he expounded it. He defines one limit to possible speeds as the limited strength of materials in relation to their weight, but also points to the fact that the properties of materials are essentially restricted in other respects, for example by the limited temperature at which a material retains its strength. He then goes on to deal with dynamic effects and stresses arising from acceleration and to consider the problem of vibrations and the periodic forces set up by the reciprocation of moving parts. This in turn leads him to call attention to the danger which arises if these forces synchronise with the natural period of oscillation of the whole or of a part of the structure. Reynolds concludes by reflecting on the possibility of balancing the whole or a portion of the moving masses in a locomotive and points out that, while the revolving parts may be completely balanced, it is impossible to achieve complete balance of the oscillating masses. Although not included among the Collected Papers, an investigation of the fatigue of materials subjected to repeated stresses deserves notice as a contribution of some significance. The research was conceived by Reynolds and carried out in his laboratories. It is described in a paper with J.H. Smith published in the Philosophical Transactions of the Royal Society in 1902 . 8. Reynolds, O. and Smith J.H. 1902 On a throw-testing machine for reversals of mean stress. Phil. Trans. Roy. Soc., Ser. A., vol. 199, p 265.